Join the Vassals of Kingsgrave for the fourth meeting of the VOK Book Club. 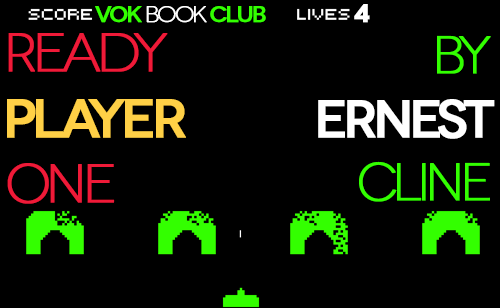 We leave the real world to enter the OASIS and discuss “Ready Player One” by Ernest Cline. Join hosts Greg, Zach, Brett, Duncan, Paul & Alex as they debate how awesome the 80s actually were, how healthy it is to live in a virtual world even if you do have your own X-Wing fighter, the pros and cons of watching Highlander 200 times, and why you should always let the girl say, “I love you” first. We also ponder what the true nature of happiness is anyway. Be sure to vote on the forums for the next pick of the VOK Book Club! Note: The first 27 minutes of the discussion is spoiler free. When you hear “The Safety Dance” playing that means we are moving to the spoiler-filled discussion. This entry was posted in Books & Novellas, Fandom, Podcast, Science Fiction and tagged Alias, claudiusthefool, LuckyCharms, Pod's Plight, Valkyrist, White Raven. Bookmark the permalink.